The museum of the history of Bandō prisoner-of-war camp "Baruto-no-niwa"　in Naruto. 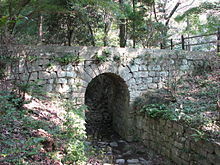 The Bandō POW camp (板東俘虜収容所, Bandō Furyoshūyōsho) was a prisoner-of-war camp during World War I in what is now Naruto, Tokushima Prefecture, Shikoku Island, Japan. From April 1917 to January 1920, just under a thousand of the 3,900 German soldiers captured at Tsingtao, China in November 1914 were imprisoned at the camp. When the camp closed in 1920, sixty-three of the prisoners chose to remain in Japan. A head of the camp Lieutenant Colonel Toyohisa Matsue created opportunities for the prisoners to interact with residents on Shikoku. During their internment he allowed the prisoners to form an orchestra which performed over a hundred concerts between 1917 and 1920, including at nearby Ryōzen-ji. On 1 June 1918 the prisoners mounted the first performance of Beethoven's Ninth Symphony in the country. This event is the origin of the popularity of the symphony in Japan, performed numerous times at the end of each year, and is celebrated annually with a concert at the Naruto Bunka Kaikan on the first Sunday in June. The Naruto Doitsu-kan (鳴門市ドイツ館) or German House museum opened in 1972 to exhibit related items. In 1974 Naruto was twinned with Lüneburg in Germany and the subsequent accession of further materials necessitated the move to new premises. A new building near the former camp opened in 1993. ^ a b Johnston, Eric (13 June 2006). "Bando POW camp: chivalry's last bastion". The Japan Times. Retrieved 29 April 2011. ^ "Monument to chief of WWI POW camp, known for humanitarian treatment of POWs, unveiled in Fukushima". The Japan Times. September 23, 2018. ^ "Heimat Bando (historic photographs)" (PDF). Archived from the original (PDF) on 2012-03-23. Retrieved 11 May 2011. ^ Brasor, Philip (24 December 2010). "Japan makes Beethoven's Ninth No. 1 for the holidays". The Japan Times. Retrieved 11 May 2011. ^ "Annual Events in Naruto". Naruto City. Archived from the original on 2011-10-06. Retrieved 11 May 2011. ^ "Cultural & Tourist Facilities - German House (Doitsu-kan)". Naruto City. Archived from the original on 2011-10-06. Retrieved 11 May 2011. Wikimedia Commons has media related to Bando POW camp. Wikimedia Commons has media related to Naruto German House. Burdick, Charles (1984). The German Prisoners-of-War in Japan 1914-20. Rowman & Littlefield. ISBN 978-0-8191-3761-6. This page was last edited on 24 February 2019, at 05:13 (UTC).